This column was written by Jennifer Rubin. Former Massachusetts governor Mitt Romney is under fire as he pursues the 2008 Republican presidential nomination. A recent Internet video highlighted comments made during a 1994 debate against Sen. Edward Kennedy in which Romney declared that he supported a "woman's right to choose." Romney quickly distanced himself from those comments, winning praise from conservative pundits. But a look at Romney's second campaign, the 2002 race for Massachusetts governor, reveals that his pro-choice stance and support for embryonic stem cell research were clear and ardent less than five years ago. I respect and will protect a woman's right to choose. This choice is a deeply personal one. Women should be free to choose based on their own beliefs, not mine and not the government's. The truth is no candidate in the governor's race in either party would deny women abortion rights. So let's end an argument that does not exist and stop these cynical and divisive attacks that are made only for political gain. As he had with Planned Parenthood, Romney answered "Yes" to questions asking whether he supported Roe v. Wade and opposed attempts to restrict abortion. After completing the questionnaire, Romney met with three NARAL executives. In this meeting, NARAL executives recount, Romney evidenced no hesitation about his pro-choice views. He also tried to pique the executives' interest in endorsing him by bluntly acknowledging that he had higher political aspirations, saying, "You need someone like me in Washington." Moreover, those present recall that Romney argued that his election would make him credible in the Republican party nationally and thus help "sensible" Republicans like him overshadow more conservative elements in the GOP. That spring, Romney also personally telephoned the group Republican Majority for Choice and asked for its endorsement. Completing a questionnaire similar to those of other pro-choice groups, Romney got what he wanted from the pro-choice Republicans. His campaign trumpeted the endorsement with a press release. At the Massachusetts GOP convention in April 2002, Romney articulated views entirely consistent with the pledges he had been giving the pro-choice groups. "Believing in people is protecting their freedom to make their own life choices, even if their choice is different from yours," Romney said. "Accordingly, I respect and will fully protect a woman's right to choose. That right is a deeply personal one, and the women of our state should make it based on their beliefs, not mine and not the government's." In much the same manner as he had done in the 1994 Senate debates, Romney repeated his pro-choice views later that year in the October 2002 gubernatorial debates, even invoking his mother, Lenore Romney, who favored abortion rights when she ran for the U.S. Senate in Michigan in 1970. Romney would later say that his views were evolving at this time and that when pressed he would say he was "personally" pro-life. However, he evidenced no such hesitation when he sought the endorsement of pro-choice groups. To the contrary, he repeatedly tried to reassure pro-choice advocates by stating that he would not alter the "status quo" with regard to abortion laws. He frequently dismissed claims that his pro-choice credentials were inferior to his opponent's. Attempting to dispel doubts about his pro-choice credentials at the 2002 GOP state convention, Romney repeated that any argument that said he was less supportive of a woman's right to choose than others was "cynical and divisive." In their debate in October 2002, Romney's Democratic opponent Shannon O'Brien said, "It comes down to a matter of trust. I think Ted Kennedy said it best when he was running against Mitt Romney in 1994. His opponent wasn't pro-choice or anti-choice, he was multiple choice." Whereupon Romney said: "Let me make this very clear: I will preserve and protect a woman's right to choose." O'Brien noted Romney's 1994 endorsement by the pro-life Massachusetts Citizens for Life and mentioned that Romney had written a letter to a Salt Lake City newspaper in 2001 asking that he not be referred to as "pro-choice." Romney responded that his opponent was "shamelessly trying to play on voter fears about abortion rights." He added that he "do[es] not take the position of a pro-life candidate." Romney's running mate, Kerry Healey, was quoted at the time of the debates as saying: "There isn't a dime of difference between Mitt Romney's position on choice and Shannon O'Brien['s]." In addition to abortion rights, in 2002 Romney sang the praises of embryonic stem cell research, showing no concern that such research resulted in the destruction of embryos. On June 13, 2002, Romney spoke at a bioethics forum at Brandeis University. In a Boston Globe story filed the next day, he was quoted as saying that he endorsed embryonic stem cell research, hoping it would one day cure his wife's multiple sclerosis. And he went on to say: "I am in favor of stem cell research. I will work and fight for stem cell research," before adding, "I'd be happy to talk to [President Bush] about this, though I don't know if I could budge him an inch." When pressed, however, Romney and his aides declined to offer an opinion on "therapeutic" or embryonic cloning. Romney won the 2002 Massachusetts gubernatorial election by more than 100,000 votes, many from pro-choice supporters. Jennifer Blei Stockman, national co-chair of Republican Majority for Choice, recalls Romney personally calling to thank her group after the election, saying, "We made a difference." 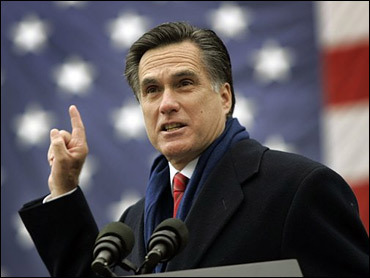 Two years into his governorship, in February 2005, Romney announced his opposition to stem cell research. Then, to the dismay of his pro-choice supporters, he vetoed a July 2005 bill making available Plan B or "morning after" contraception. Also that year, in an op-ed for the Boston Globe, he declared himself pro-life. Romney says he changed his mind in November 2004, when he met with a scientist from the Harvard Stem Cell Institute. Romney claimed in a June 2006 interview that the researcher had told him: "'Look, you don't have to think about this stem cell research as a moral issue, because we kill the embryos after 14 days.'" Romney went on to say that both he and his chief of staff had an epiphany, recognizing that embryonic stem cell research cheapened respect for human life. However, the scientist with whom Romney had met, Dr. Douglas Melton, disputed Romney's story. A spokesman for the institute confirmed Dr. Melton's account, saying, "The words 'kill' and 'killing' are not in Dr. Melton's professional vocabulary, a vocabulary used to discuss finding cures for diseases in order to save lives." Was Romney an unseasoned politician who changed his views upon deep reflection? Stockman, of Republican Majority for Choice, thinks not. "He was a grown man in 2002 and very thoughtful and introspective," Stockman says, "so the fact that he says he hadn't thought through these issues seems very odd." Melissa Kogut, NARAL Pro-Choice Massachusetts's executive director, says, "It is conventional wisdom that candidates in Massachusetts need to be pro-choice to win. He ran as pro-choice. As he began exploring the run for president, he changed. No matter where you stand on this issue, you should question where he stands." Angus McQuilken of Planned Parenthood says, "When a candidate or elected official can move so easily from one position to the opposite overnight, it leaves voters wondering whether he has any core values." Asked recently about Healey's not "a dime of difference" remark during the 2002 campaign, Romney's opponent Shannon O'Brien told me: "Apparently there was a lot more than a dime's worth. Probably enough to put my daughter through college."